At Kraft Davies, PLLC, in Seattle, Washington, we represent clients suffering a variety of neck, back and head injuries due to the negligence of another party. Even minor damage to your body can have long-lasting effects. You need to enlist the services of an experienced attorney to secure the compensation you deserve. From soft tissue to closed head injuries, we hold individuals and companies responsible for their negligence. Contact us at 206.624.8844. If you have suffered any of the common injuries listed below or physical damage that is not listed, please contact us immediately for aggressive representation. 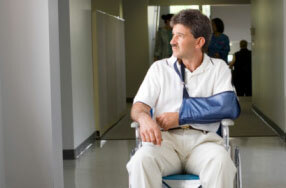 Painful neck and back injuries commonly occur in car, truck and motorcycle accidents. From soft tissue injuries to a broken back or neck, the damage can impact your personal life, not to mention your ability to perform the most basic functions of your job. If an accident results in you losing consciousness, you may have suffered brain trauma. Closed head injuries or skull fractures can result in minor and serious brain damage. The victim may not be aware of a disability that is obvious to friends, family and an experienced attorney. Injuries to your spinal column can result in lifelong physical challenges or paralysis, confining you to a wheelchair. Our job is to identify your damages if you are unable to live the life you once enjoyed. Medical treatment is mandatory if you suffer a broken bone. Swelling and intense pain is only the start of the symptoms. Recovery is challenging and permanent damage may be likely. Damage to such a sensitive area will likely result in lifelong issues. When your vision is affected or lost, every aspect of your life is altered. Pain and suffering are only the start. You may also be entitled to compensation for lost wages, both in the present and in the future. For more information or to schedule an appointment with an experienced lawyer in Seattle, Tacoma, Bellevue, or nearby areas in Washington, regarding a spinal cord or head injury, please contact us online or call 206.624.8844.